Water Extraction involves removing water from a flooded home or business and is always necessary for water damage restoration. While water extraction seems straightforward, all moisture must be extracted properly to prevent black mold from growing and spreading within flooring, walls, and other structures of your home or business. We will start extracting the water, removing damaged materials, and drying the structure as soon as we arrive at your residence or business. We have a large inventory of professional machines that will ensure your home is completely dry. We set up air movers in a vortex pattern and use dehumidifiers and HEPA vacuums to extract flood waters and humidity. We remove all soaked and damaged baseboards, drywall, insulation, carpeting, flooring, and beams. The moisture levels are tested to make sure there is no flood-related humidity left. The machines we use run for several days and are extremely effective. We inspect carefully and remediate all mold that we find, applying anti-microbial spray to prevent future growth. Only once the water and humidity has been completely extracted and mold has been remediated do we rebuild with the same pre-existing quality. Sometimes, older construction materials such as 9×9 tiles and lead paint are present in rooms such as basements. These may contain lead and asbestos. Unlike many contractors, we are licensed, certified, and equipped to deal with dangerous and toxic substances like lead and asbestos. We are often called to take over flood cleanup efforts where other companies have to step away because of the danger. With our expert craftsmanship, we ensure that your home will be in the condition it was in before the flood. If you are in need of water extraction after a flood, let us bring our experience and expertise to get the job done right. 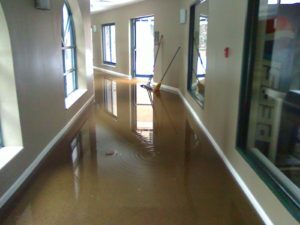 Call us now at (877) 645-1428 for our flood damage restoration services.